NTH Consultants, Ltd. (NTH) was retained by the Detroit Water and Sewerage Department (DWSD) to design approximately 73,000 feet of 24-inch transmission main throughout various streets with the City of Detroit. NTH built a design team that provided the experience and technical knowledge to develop a design that was practical and affective. To enhance project management, the project we split into three generally equal Contracts for ease in design and subsequently bidding and construction. NTH was responsible for the planning, coordination, periodic reviews, and meetings with the project team, DWSD staff, and other utility departments and jurisdictional authorities. NTH searched through the records of DWSD and other City Departments, contacted various utility companies and jurisdictional authorities to secure records from them. NTH prepared a preliminary design (80%) according to DWSD standards and assisted with the procurement of permits to work within the associated right-of-way. information received from utility companies and to locate utilities for which no information was received. 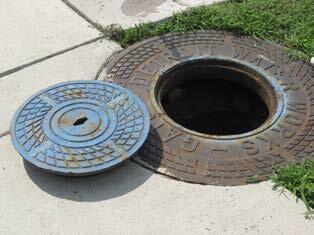 NTH’s attention to detail is highlighted in this step, by physically going to potential utility conflict areas and opening manholes and confirming and/or correcting what was shown on provided utility drains. NTH conducted a geotechnical investigation at approximately 1,000-foot intervals (82 soil borings) along the proposed water main alignment depths of 5 to 10 feet below planned inverts. NTH was responsible for obtaining all necessary permits and traffic control to facilitate drilling. Permits obtained included City of Detroit, Wayne County Department of Public Services, and Michigan Department of Transportation. We followed up the drilling activities on a staged schedule to confirm that borings and sites were left as they were prior to our investigation. This included detailed follow-up with the associated permit agencies as necessary.